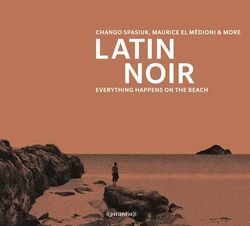 Latin Noir invites the listener to an emotional discovery of melancholic rarities from the modern and traditional world of Latin Music. Latin Noir presents the fifth edition of the exclusively packaged Série Noir by Piranha Musik in reference to an established genre for film and literature, darkly illuminating life's brooding, melancholy landscapes. Previous releases in the series were Egypt Noir, Luso Noir and Brass Noir and Orient Noir. The Latin Noir compilation features a selection of happy sad musical treasures from Cuba, Argentina, Colombia, New York and both sides of the Mediterranean Sea. If you are looking for hip-shakin', hands-in-the-air party music this album is not for you. But it is a clever compilation of tracks for the avid World Music Collector. The various musical styles on this deeply emotional journey span from the earthy, almost tango-like melancholy of the North Argentinian accordion via longing love songs of the Cuban Trova to touching laments about boat-refugees in a modern Latin-Mediterranean tinge. Accordion master and Latin Grammy nominee Chango Spasiuk opens Latin Noir with Argentinian Chamamé music that fuses complex rhythms of African and Creole-Spanish immigrants with those of indigenous Mbya-Guaraní Indians and Middle European settlers. The compilation includes rare musical treasures such as the Cuban Guaracha "La Negra Tomasa" which tells a tale about the haunting powers of the Mandinga culture. A version of the song was later made popular around the world by the Buena Vista Social Club under the title "Mandinga". Bonus track "La Patera" by Watcha Clan concludes the album's journey with an emotional lament about the boat-refugees who try to break the borders between Africa and Europe. Latin Noir was curated with a particular Sicilian perspective by Berlin-based, Italian-born electro-jazz producer and DJ Sonia Brex. 1. Chango Spasiuk - "Tierra Colorada"
Argentinian accordion master and Latin Grammy nominee seeks redemption crossing the red land. 2. Seguidores Del Son - "Todo Eso"
In this classic "Son Montuno" (from the Hinterland) African and Spanish cultural heritage combine to say "That's all folks", the Latin way. 3. Eddie Bobè feat. Orlando "Puntilla" Rios - "Rumba Para Los Olu Bata"
New York's Central Park has been the meeting place for celebrating the Caribbean rumba tradition despite regular harassments by the authorities. Nuyorican and Cuban musicians come together to remember. 4. Ana Cristina Pozo & Omar Perez - "Déjame Me Que Te Lleve"
"Let me take you with me" on a journey through the kingdom of time and hope. A "Canción" from the "Trova" tradition intoned by the Cuban troubadour duo. 5. Conjunto Campesino Cuyaguateje - "La Cola De Tu Caimán"
The band took its name from a small Cuban river and sing about riding the back of a caimán in "Música Campesina" (Country Music) style. 6. Estudiantina Invasora - "Commandante Che Guevara"
Santiago de Cuba's finest remember the ghost of the revolution between promise, displacement and t-shirt iconism. 7. Maurice El Médioni meets Roberto Rodriguez - "Oh! Ma Belle"
Grandmaster of the pianoriental meets Cuban super drummer. Dreaming together in exile of roots that never were. 8. Son del Mayabeque - "Runidera"
The trumpet takes lead when the "Son" hits town. Ignacio Piňeiro, one of the founding fathers of modern Cuban music, composed this song, originally performed by his septeto nacional. 9. Piquete Tipico Las - "Alturas De Simpson"
When Miguel Failde premiered "Las Alturas de Simpson" on 1 January, 1879, at "El Club" in the Cuban city of Mantanzas, he established a new popular genre called "Danzón". 10. Alfredo Gutiérrez - "La Distancia"
He is praised as the king of kings in the "Vallenato" accordion valleys of Colombia and knows a thing or two about covering distance in good time. 11. Grupo El Organo Pinareňo - "La Negra Tomasa"
"Double Noir" is the "Guaracha" by the group from Pinareňo, Cuba. "Everything makes me go wild for black Tomasa", also recorded by the Buena Vista Social Club under the title "Mandinga". Two virtuoso Cuban percussionists combine their urban know-how with the ancestral rhythms of Santeria cult tambor for a joint message to travel the world. 13. (Bonus track) Watcha Clan - "La Patera"
The Marseille-based collective led by the striking Sista K conclude the album's journey with their lament about the boat-refugees who try to break the borders between Africa and Europe.